We have an innate desire to preserve things: spaces, objects, memories. Preservation implies a sanctification, a remove from touch, and guard against eventual decay. Public spaces are redeveloped, graffiti is removed, and a new coat of paint added. Art objects, once delicately handmade, are often removed from touch by display cases and the demarcated spaces of museums. Local artist Julia Goodman is interested in interrupting this process through a focus on ephemerality, ritual, and meditations on time. Goodman’s art practice consists of collecting junk mail once a week from her neighbors in Bernal Heights and transforming the junk mail into cast handmade paper sculptures. Her practice is multi-dimensional: community oriented as she travels door to door collecting paper and studio based as she engages in the laborious process of carving wood, making and casting paper. Goodman’s piece “Eleven Month Mourning Project: August 19, 2007 – July 14, 2008” is representative of her dynamic process and adds a public dimension to her practice. Goodman created “Eleven Month Mourning Project” as a way of providing herself time to mourn the loss of her father. The foundation of the project is the Mourner’s Kaddish, a Jewish ritual of reciting a prayer in the presence of others for eleven months after the death of a parent. 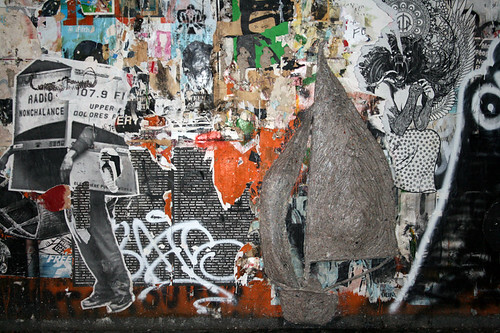 For each month Goodman created a series of handmade cast paper sculptures and with this work engaged in public art actions, wheat-pasting one piece each day in a public space. The forms of her sculptures–birds in flight, phases of the moon, arrows depicting wind patterns, and sailboats–are a coded language of impermanence and often intangible movement. In Goodman’s words they represent a “different way of navigating through space.” In a more direct symbol, Goodman created a series of silhouettes of John F. Kennedy, Jr. saluting during his father’s funeral; an image that became a national icon of mourning and speaks to the experience of a bereaved child. The site of Goodman’s nightly wheat-pastings has a story of its own. 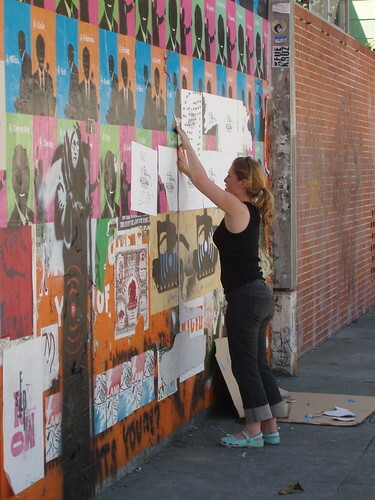 The “art wall” at 1240 Valencia Street, known as the (de)Appropriation Project, is a site for free speech, artistic expression, and an ever evolving conversation among artists and community members. Once the former Mission District Police Station, this building has since been transformed into the architecture and furniture design studio and private residence of Bruce Tomb. As the owner, Tomb made an intentional decision to designate the wall as a free speech area, allowing artists like Goodman a public forum for communication. At any given time the wall displays political posters, spray painted graffiti, original artworks, advertisements or announcements for events. It is a messy time capsule of layered messages, creating a place for what might otherwise be considered an eyesore in the urban landscape. The wall, much like Goodman’s project, interrupts the grid of linear time, of expectations within public space, and human behavior. During my own wheat-pasting projects at 1240 Valencia Street I’ve come to realize that there is an internal community of Mission District residents intimately connected to the wall–not only those who add to it but the many people who witness its evolution, including Tomb himself. The act of pausing on a city sidewalk, let alone wheat-pasting in broad daylight, causes passersby themselves to pause, to recognize the wall as somehow distinct from its surroundings, and to engage with its layers of messages. In these moments conversations are initiated and time slows down. For Goodman the physical texture of the wall was an important element in her project. She describes the wall’s evolution as a “non-linear breakdown of entropy” as the layers fall off, they reveal past messages and become as important to the wall’s transformation as the new pieces added to it. 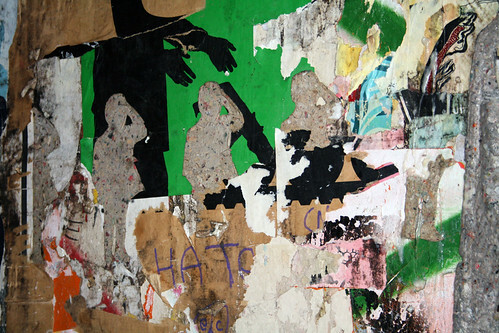 Even when her paper sculptures are no longer visible they can be felt under layers of posters and glued paper. Like the wall, Goodman’s own work invites touch; the edges of her forms are rough and ripped and flecks of various colors and materials create an uneven texture. 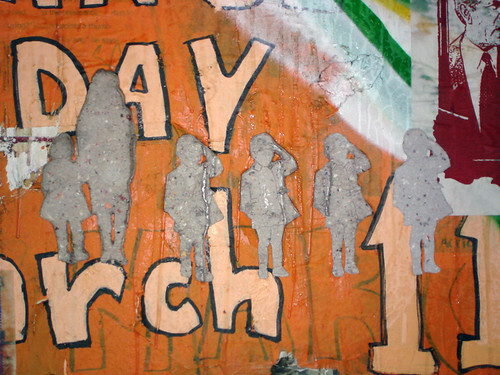 One day in March 2008 the wall received a new facade–a layer of orange paint that reached from its very top to the sidewalk with information about “Prisoner Awareness Day.” This orange stood in stark contrast to Goodman’s palette of greys and flecks of color. It allowed for an entirely different context and interpretation of Goodman’s work. Today, the orange is only visible in the spaces where the layers have peeled or at the top beyond one’s reach. Part of the beauty of 1240 Valencia Street is that it is guaranteed to change. There is a way in which both the (de)Appropriation Project Wall and Goodman’s practice rely upon this transformation. In transforming junk mail to handmade paper sculptures, Goodman’s work references a larger network and infuses this consumer material with a handmade, ritualistic quality. In wheat-pasting the paper sculptures at 1240 Valencia Street, Goodman ensures that the material will change once again. Goodman’s interest in the possibility of ephemerality and anonymity in art was born from her time spent studying murals in Valpariso, Chile. In the 1980s during the Pinochet regime murals painted by Chileans were immediately painted over by the government. These impermanent messages were political in nature and more often than not acknowledged the population of Chileans disappeared due to their opposition to the military government. For Goodman, these paintings, while rendered quickly and therefore not technically detailed, communicated the importance of expression in public space. Like reciting a prayer in the presence of others or communicating a message on the walls of a city, the public serves as a witness and site for testimony. As the owner of 1240 Valencia Street, Tomb insists that the wall is owned by those who use it; thus allowing the wall to regulate itself. In calling the wall the (de)Appropriation Project Tomb complicates our common understanding of authorship. Appropriation means to take something that is not yours for your own purpose, a deliberate act of acquisition often without the permission of the owner. Appropriation gives authorship and authority to an original. In the context of 1240 Valencia Street, what does it mean to (de)Appropriate? To leave something alone and allow it to stand on its own without explanation or classification? To adamantly unincorporate something into a larger whole? Or in Goodman’s eyes, to stop trying to have ownership over something and be willing to let go, to slow down and be a witness to processes both natural and intuitive. The remaining traces of Goodman’s repetitive art actions mark 1240 Valencia Street as a site of ritual therefore offering different possibilities for our experiences of urban space and urban time. To view the past twelve years of the wall at 1240 Valencia Street, including Goodman’s “Eleven Month Mourning Project” check out the (de)Appropriation Project Archive website, featured by Southern Exposure in 2007.